A few weeks ago I attended my eighth consecutive PAX Prime. 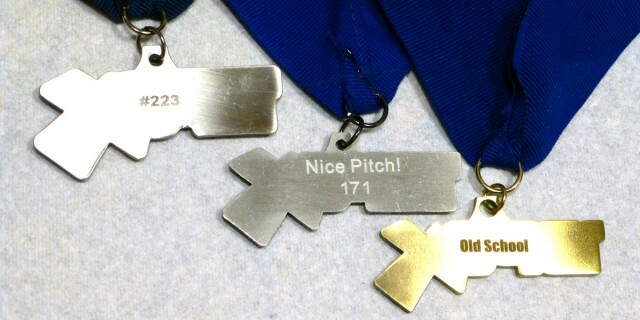 While there are many things to love about PAX, one of my personal favorites has become the PAX medals. 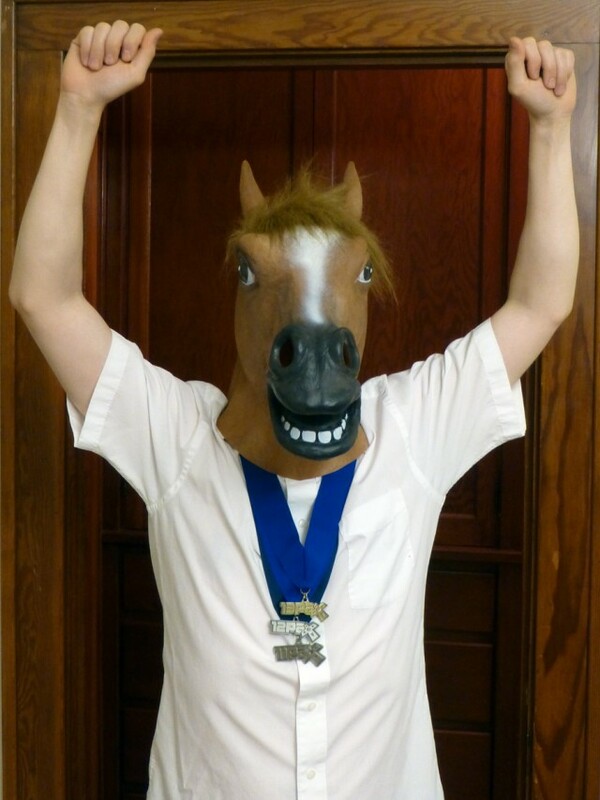 All weekend long there are various tournaments and contests you can participate in to win a medal. 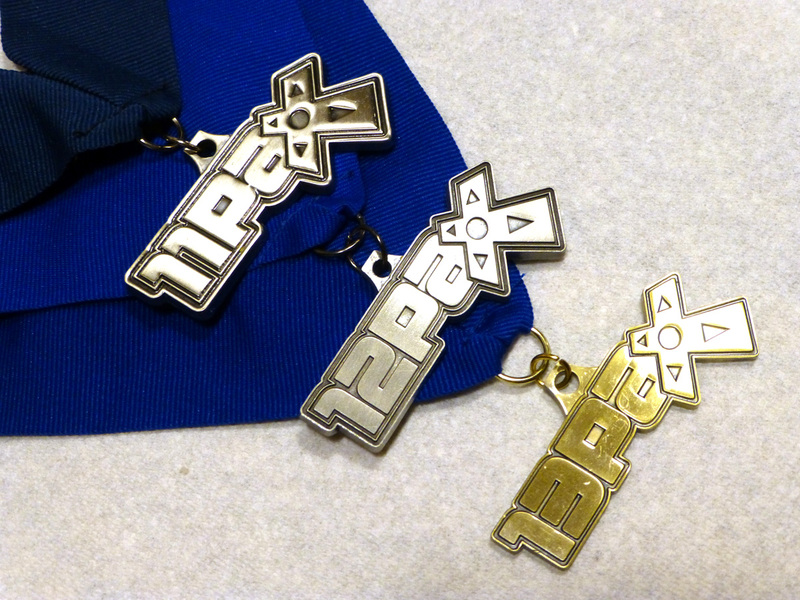 I have won a PAX medal at each of the last three PAX Prime events that I have had the pleasure of attending. In 2011 I got one for placing second in a Pac-Man Championship Edition DX tournament. 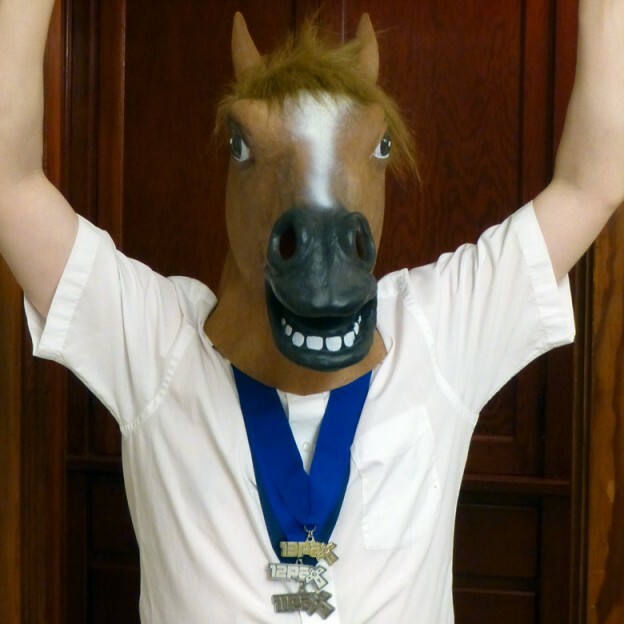 In 2012 I won one for having the second-best pitch at the Pitch Your Game Idea panel. This year I won a high score contest for the Super Nintendo game Tin Star, using the SuperScope. As I was enjoying my PAX medals, I noticed something odd. Each year, the PAX medals are getting slightly smaller. Time to break out some measuring tools. That’s 4cm of ribbon loss in just two years. At this rate, PAX medals will be a 15cm choker by 2020. The shrinkage of the medals is even more dramatic than the ribbon shrinkage. If it keeps up at the same rate they’ll disappear completely by 2020. Finally, let’s weigh these suckers on my kitchen scale. The loss of mass is the most extreme, with an average loss of 3.5g per year putting the medals on a path to vanish entirely by 2018. 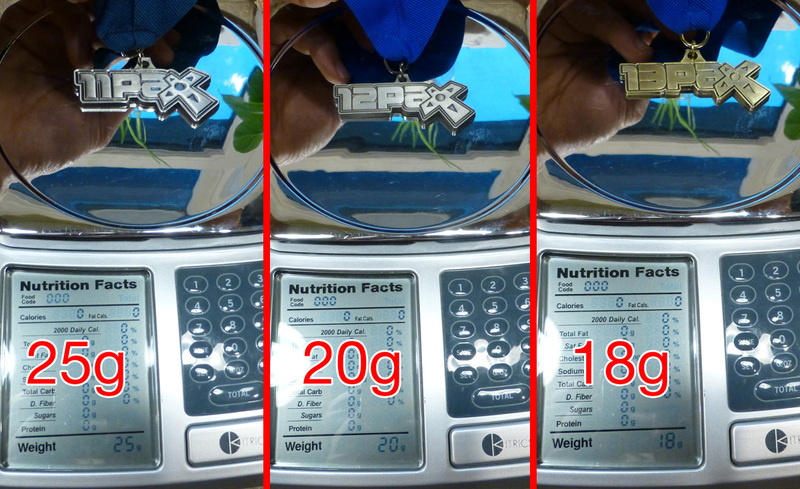 Also, apparently PAX medals are not very nutritious. There is one category in which PAX medals are getting measurably better: back-side engraving. The 2011 medal just had a generic number. The 2012 medal still had the number, but they added a bit about what the medal was for. In 2013 the number was dropped entirely and the font got a sweet upgrade. Anyway, this is all apparently interesting enough for me to write a 333-word blog post, but despite the shrinkage, I still enjoy my PAX medals. Here’s another great story about data, this time on a small scale. Dan Anderson is a high school math teacher. As part of a class exercise, he had his kids measure the “stuf” content of regular Oreo cookies, “Double Stuf” Oreo cookies, and “Mega Stuf” Oreo cookies. 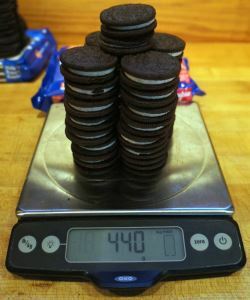 According to his kids’ calculations, the “Double Stuf” Oreos contained 1.86x as much filling as regular Oreos. Oops. After his original blog post blew up on the internet, Dan did a more extensive experiment of his own and came up with similar results: “Double Stuf” Oreos contained just 1.89x as much filling as regular Oreos. A spokeswoman for Nabisco told ABCNews.com the company’s Double Stuf Oreos are made to have double the creme filling as the original Oreos. 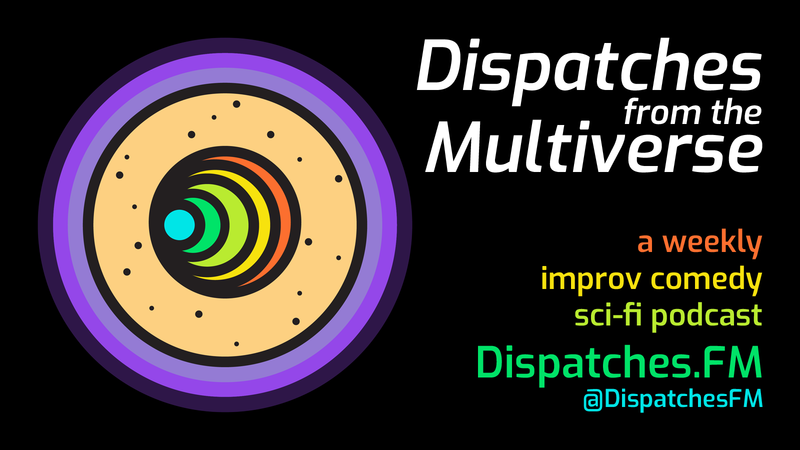 “While I’m not familiar with what was done in the classroom setting, I can confirm for you that our recipe for the Oreo Double Stuf Cookie has double the Stuf, or creme filling, when compared with our base, or original Oreo cookie,” the spokeswoman said. And yet… That’s not what the data actually shows. I love stories of people or companies using data in interesting ways, and today I came across a great one. [Los Angeles attorney David] Chan, 64, has eaten at 6,297 Chinese restaurants (at press time) and he has documented the experiences on an Excel spreadsheet, a data-centric diary of a gastronomic journey that spans the United States and beyond. Chan was eating at new restaurants faster than they could open up. Soon there wasn’t a single one in the area he hadn’t tried, but still, he was unsatisfied. In 1985, he hit 86 restaurants in the Los Angeles area and around the country. The next year, 119. Before long he was trying more than 300 restaurants every year. In Toronto, he hit six dim sum restaurants in six hours. When he traveled for business in Florida, he zigzagged the state to sample 20 Chinese restaurants. Chan had always wanted to travel to all 50 states, and Chinese food gave him an excuse. In places he would have never imagined, he found Chinese people with their own version of Chinese food. They’ve also created a neat interactive timeline visual of the LA-area visits documented in Chan’s spreadsheet, a static portion of which I’ve excerpted above. The article doesn’t really get into the details of how he’s kept his list, or what types of information he keeps about each visit aside from the date, location, decor, and his order. Since he started his list in 1955, he must have kept it in a paper journal for decades before taking the time at some point to transcribe it all into Excel. That is a seriously impressive dedication to data. [Councilmember Jane] Hague then wanted to know if the region could support so many teams. Counting the NBA and NHL, as well as the University of Washington football team playing in a new stadium, Councilmember Larry Phillips said the area could have seven major teams. He wondered if any other “midsized major market” supported that many. “I think this area can support it,” [former Sonics coach Lenny] Wilkens said. Phillips said he’d want to see a market analysis. Traditionally the only kind of market analysis I do is for the Seattle real estate market, but once in a while I like to branch out, so I thought I’d give the Council a head start. 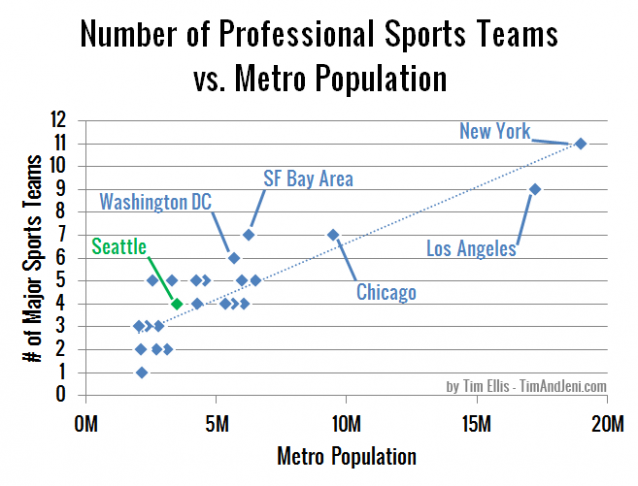 To get an idea of how reasonable it might be to have six professional sports teams here in the Seattle metro area, I took a list of the top 30 largest metro areas in the United States and counted up how many pro sports team each metro area currently has. For this analysis, I decided to exclude college sports and just focus on NFL, MLB, NBA, WNBA, NHL, and MLS. Las Vegas is the 30th-largest metro but has no pro sports teams so we’ll leave it off the chart. LA’s Inland Empire (Riverside & San Bernardino Counties, #12 on its own) doesn’t have any sports teams of its own, so I included its population with LA. I’ve also included the San Jose metro area population (#31) with the San Francisco population to better reflect the whole Bay Area. As you can see, Seattle’s current collection of professional sports teams puts us slightly above the trendline of these 28 metro areas. If we were to add NBA and NHL teams to our roster, it would put us on par with Washington DC, a metro area with 63% more people than Seattle. Click on any column header to sort by that column. 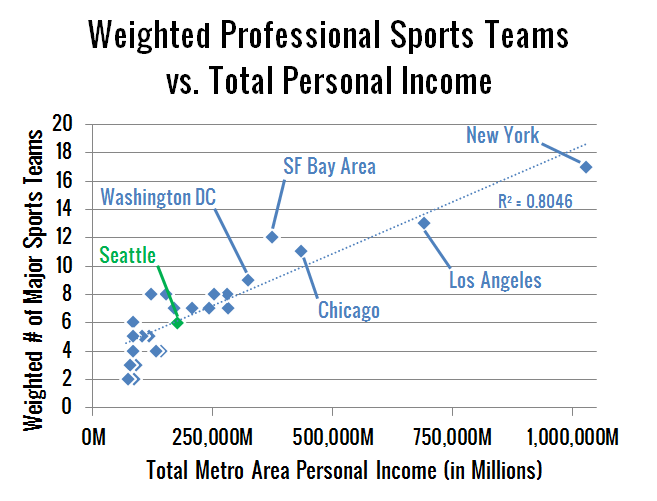 At 875,007 residents per local pro sports team, Seattle is already 25% below the 28-city average of 1,174,483. If we were to bring both NBA and NHL teams to our market we would shoot to a full 50% below the average. Obviously a more detailed analysis would take into account incomes, recreational spending patterns, and other factors. 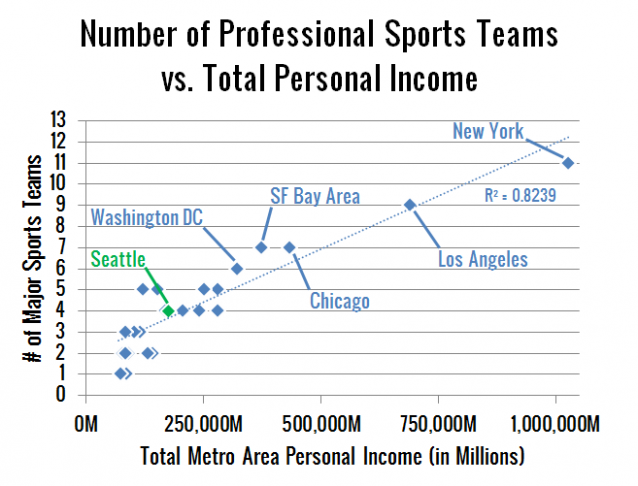 That said, we’re obviously not hurting for pro sports teams here in Seattle, relative to the size of our market. So why exactly do we need to spend $200 million in public funds to build a new stadium and bring two new pro sports teams to Seattle? There have been a number of comments on the Seattle Times piece as well as here on this post about the various other factors that need to be considered when attempting to answer the question of whether Seattle can support six pro sports teams. Although I did plainly call out that this was just a cursory analysis meant to answer the specific “metro size” questions posed by the Councilmembers, I decided to get the latest Personal Income data from the Bureau of Economic Analysis to run a few additional numbers. I made a weighted version of this one, too if you prefer that. For the non-stats-nerds out there, the R² value on the chart is the coefficient of determination, which is basically a way of measuring how closely correlated two sets of values are. In this case, total Personal Income and number of sports teams are 82% correlated, which is pretty high, and sightly better than the 79% correlation between population and number of sports teams. 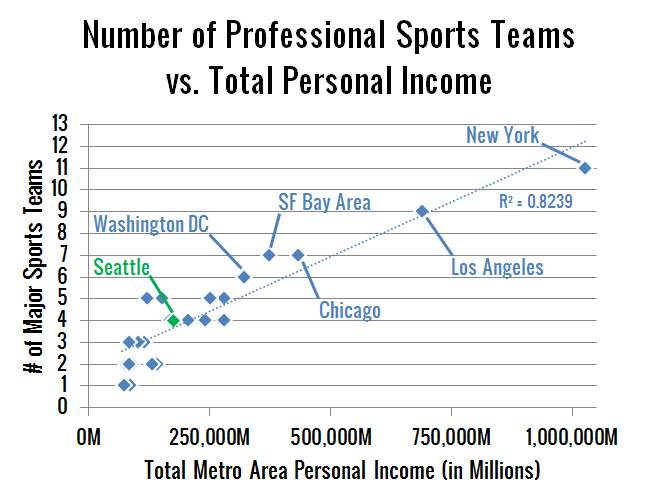 At $44,021M in Personal Income per local pro sports team, Seattle is currently 15% below the 28-city average of $51,811M. If we were to bring both NBA and NHL teams to our market we would be at 43% below the average. It would appear that the answer comes out roughly the same when you factor incomes into the equation. 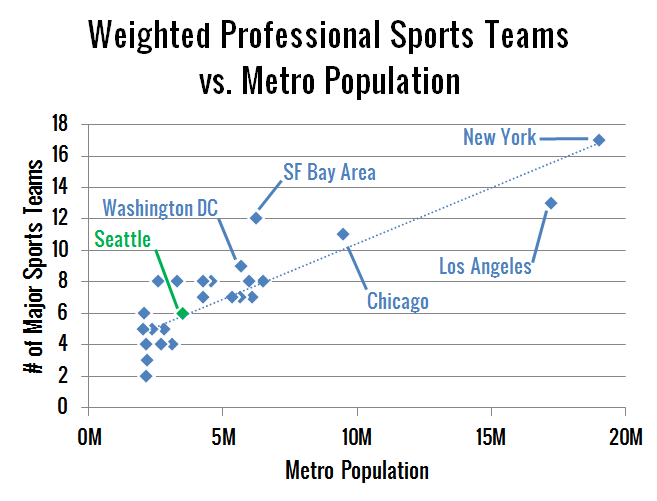 Seattle still just doesn’t stack up with the metro areas that have six or more teams. Lastly, it’s worth noting that I personally don’t really care whether Seattle gets a new stadium and two new teams. I’m neither a sports fan nor a sports hater. I’ve got no horse in this race, and nobody’s paying me to do this basic analysis. I just saw the Councilmembers quotes in the Seattle Times and thought it was an interesting question worth exploring.